current and projected future electricity demand. Massachusetts Institute of Technology, Copyright © 2015 Massachusetts Institute of Technology All rights reserved. In this era of the transitional energy technology cusp, what we need now and what we will use to generate power in future are two very different things. Some say current technology, including battery technology, is all we need. I disagree. Here are some promising advances in solar technology which may light our future, but which at the current time are still in development. Due to the actual state of technology today I have no objection to the deployment of new generation clean coal power generation. This is a far better interim solution for Australia than nuclear power, for reasons outlined in previous posts and in the next post to come. The group hopes to demonstrate a full operating device with record efficiency within 5 years’ time. If they are successful, they feel could become a disruptive technology in solar energy. ” Source: https://www.technion.ac.il/en/2016/11/photovoltaic-cells-70-efficiency/ Expected lead time: 5 years. “Abstract: The maximal Shockley–Queisser efficiency limit of 41% for single-junction photovoltaics is primarily caused by heat dissipation following energetic-photon absorption. Solar-thermophotovoltaics concepts attempt to harvest this heat loss, but the required high temperatures (T>2,000 K) hinder device realization. Conversely, we have recently demonstrated how thermally enhanced photoluminescence is an efficient optical heat-pump that operates in comparably low temperatures. Here we theoretically and experimentally demonstrate such a thermally enhanced photoluminescence based solar-energy converter. Here heat is harvested by a low bandgap photoluminescent absorber that emits thermally enhanced photoluminescence towards a higher bandgap photovoltaic cell, resulting in a maximum theoretical efficiency of 70% at a temperature of 1,140 K. We experimentally demonstrate the key feature of sub-bandgap photon thermal upconversion with an efficiency of 1.4% at only 600 K. Experiments on white light excitation of a tailored Cr:Nd:Yb glass absorber suggest that conversion efficiencies as high as 48% at 1,500 K are in reach.”Source: Ibid. “J-spacesystems has been studying Space Solar Power System (SSPS) as an alternative future energy resource under a support of METI (The Ministry of Economy, Trade and Industry) and the other related agency for the past several years. The attitude is automatically stabilized by the gravity gradient force in the tether configuration. So the antenna surface of the panel is always oriented towards the earth without any active attitude control. No moving structure in a large scale makes this system highly robust and stable. The power generation/transmission panel consists of identical modules, which greatly contributes to the low cost production, testing, and realizing high quality. Another innovative feature of the module is the application of wireless LAN system for the signal interface among those panels, which leads to the reliable deployment, integration, and maintenance. Fig3 shows concept of the “Baseline type” SSPS which is capable of 1.6GW power supply maximum and 1GW average on the ground. It is composed of a power generation/transmission panel of 2.6×2.4 km suspended by multi-tethers deployed from a bus system which is located at 10 km upward. The panel consists of sub-panels of 100 mx100 m with 0.1m thickness. Each sub-panel consists of module panels 1 mx1 m size. There is no wired signal interface between module panels. The control signal and reference signal for each module panel are provided from the bus system by the wireless LAN. “First element is generation of RF energy from the electric power. The second element is to send the energy to the point of interest. The last element is the receiving RF energy and converting it to DC electric power. In addition to these elements, we have to understand and control unwanted emission and reflection of RF energy. We have covered these elements in our testing in some extent. The beam control experiment was initiated from 2001. The active array panel with phase shifters, AIA#1, and the hardware retro-directive active integrated array panel, AIA#2, were developed and tested. The combination transmission test was also carried out. “In 2007, high accurate beam control experiment was carried out using the phased array antenna (5.8GHz, one-dimensional, 12 elements, about 40 cm wide). Some think the way to make solar power the backbone of a renewable energy economy is to avoid the problematic Earth entirely and head out into space, where the sun is always shining and weather means something entirely different. Solar power satellites (SPS) are more than a concept: it’s an area of active research and development, led by the Japan Aerospace Exploration Agency (JAXA). JAXA explained its 25 year technology development roadmap that culminates in a 1 gigawatt SPS sending solar power back to Earth in the 2030s in IEEE Spectrum last year. Last week, JAXA and Mitsubishi demonstrated their progress on one of the most difficult components of that system: long range wireless power transmission. Space-based solar power on a commercially viable scale will be an enormous undertaking. 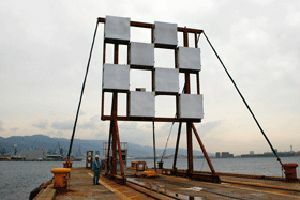 For an output of 1 gigawatt, Japan is planning on deploying a solar collector weighing over 10,000 metric tons and measuring several kilometers across. It would live in geosynchronous orbit, some 36,000 kilometers from Earth. Arguably, the most difficult part of this whole business (from a technological perspective) is getting the power from the satellite back down to Earth where we can actually use it, and until we can find a long enough extension cord, there’s only one way to make it work: wirelessly. The only efficient ways to transmit power wirelessly over a very long distance, according to JAXA researchers, is with either lasers or microwaves. Lasers are impractical because they’d run into the same problems that solar power does on Earth: they don’t work through clouds. Microwaves, though, work even if the weather is bad, so they’re what JAXA has been planning on using to transmit power. On Thursday, JAXA was able to deliver 1.8 kilowatts “with pinpoint accuracy” to a receiving antenna (rectenna) 55 meters away using carefully directed microwaves. According to JAXA, this is the first time that anyone’s been able to send such a high power output with this level of direction control. Also on Thursday, Mitsubishi (in partnership with JAXA) managed to send 10 kilowatts of power over a distance of 500 meters, using larger antennas with more of an emphasis on power over precision. The obvious question here is one of efficiency: being able to transmit power is great, but if you lose most of it along the way, will the overall system ever reach commercial viability? At this point, the conversion system (solar to DC to microwave to DC to AC) is about 80 percent efficient, but that excludes loss of energy in transit. Neither JAXA nor Mitsubishi are commenting on the efficiency of these specific tests (which, to be fair, weren’t’t optimized for efficiency), but we do know that as of last year, JAXA expected a 1.6 kilowatt microwave beam to yield a rectenna output of about 350 watts from a 50 meter test. Nuclear industry, that icon of undelivered futuristic broken promises, will scoff at these ideas and anything else which might, in the PR battle, cause it to loose even more honest face. This entry was posted in Uncategorized on March 29, 2018 by nuclearhistory.